Any seasoned DIYer worth his salt can testify that a good stud finder is the only difference between an instagram-able DIY home project and a glorified disaster. This is because before screwing or hammering things into walls, floors, and ceilings, you must know what exactly is on the other side. Alternatively, you’re at the risk of damaging your drywall, ceiling, or flooring, courtesy of the unsupported items you’re attempting to install. The fundamental purpose of the best stud finder (or any stud finder) is to accurately locate the wooden framing studs behind walls (usually drywall). While most devices offer this basic detection capability, some stud finders also locate metal beams, nails, or live electrical wires behind drywall or even plaster. You aren’t restricted to just walls though. Stud finders also work to locate joists in ceilings and some floors. 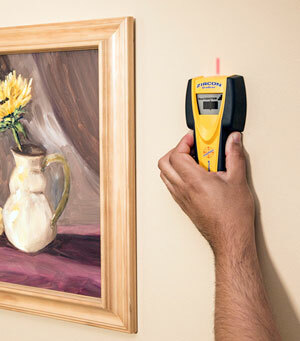 Whether you’re hanging a picture or TV on the wall, or starting a complete room renovation, a stud finder you can trust is a must. What does a stud finder detect? Why are false positives fairly common when using a stud finder? This popular stud sensor is engineered to detect a broad area of the wall while sniffing for studs underneath. Also, the additional width of the device enables you to have a more precise sense of stud positions as you propel the finder along the surface. With 13 individual sensors, it will allow you to find and mark both edges of a stud at a glance and can even detect multiple studs at the same time. With no calibration needed (unlike many other electronic models), you’re ready to go. When the edge of a stud is detected, LED lights on the front will light up, marking the position and size of any stud to allow you to find the exact starting and ending points of the stud as you work. The Franklin Sensors model is considered one of the best wall scanners for professional contractors, homeowners, or anyone else who needs a reliable stud detector. Whether you’re installing a new HD television or upgrading your garage lights, the ProSensor is quick and accurate. Probably its biggest downside is that while it can detect other objects behind walls such as electrical wiring, there’s no separate notification so you won’t know whether it’s a stud, live wire, or nail. The device uses ultra-powerful earth magnets to locate nails and metal studs the old school way. The magnets are strong enough that the stud finder stays on the wall hands-free so you can avoid marking up the wall with a pencil. The CH Hanson 03040 is naturally attracted to the screws and nails within the studs so you know exactly where they’re at. This mini stud finder all includes a two-way level for ease of use. While there’s plenty of other magentic stud sensors on the market, the CH Hanson is one of a few that includes two magnets for a detection area that’s almost twice as wide (at about 2.5″). Of course this can’t compete with the 7″ wide ProSensor above but we’re talking about 2 completely different price points. I might take a bit longer to find studs and the 1-inch scan depth isn’t the greatest, but for the occasional hanging of frames, pictures, and other objects onto a wall, the CH Hanson is an excellent budget pick when you simply don’t need any bells and whistles. When normal stud finders just don’t go deep enough or you need to locale nails in studs or other metal behind plaster, lath, tile, concrete, paneling, stucco, or other surfaces, the MetalliScanner m40 is your best option. It’s able to detect ferrous (magnetic) metal up to 4 inches deep and non-ferrous (non-magnetic) metal up to 2 inches deep. Unless you want to spend hundreds of dollars on a professional wall scanner, this Zircon is by far the best metal stud finder for the money. Plumbers and HVAC pros can quickly locate piping and ductwork behind walls when others can’t. On older homes with plaster or lath walls, most stud finders simply won’t work. The MetalliScanner locates studs in these walls like a champ, making it also the best stud finder for plaster walls. The auto-calibrating feature will save you some time as well. While it won’t pick up all metal behind walls (it has a harder time with copper piping for instance) and it may miss really small nails, you really can’t get a comparable product for the price. The Tacklife DMS04 can detect wood, metal, and AC wires deep inside the wall to correctly locate studs and prevent hazards. Its ergonomic grip design enables you to hold the device comfortably in either hand, at any angle. The large LCD display comes with an orange indicator light as well as a target indicator for error-free detection and positioning. Featuring two scanning modes, StudScan detects the edges of wood or metal studs up to 3/4″ and ThickScan detects metal like nails up to 1.5″ deep. The automatic power shutdown after five minutes of non-usage is a good battery saver. For typical at-home use for hanging picture frames or shelving, the Tacklife stud finder is worth considering. It’s definitely not perfect and some users question its accuracy, but as a low priced electronic stud finder, it’s a good value. If you’re an occasional weekend project enthusiast, then the Zircon StudSensor e50 is a stud finder for when you’re on a budget but want the accuracy of an electronic model. It’s very similar to the Tacklife above but for some reason, seems to take a bit longer to get accurate detection. The stud sensor will flash and beep at once upon detecting the edge of a stud. Also, it comes with two scanning modes: DeepScan for targets around 1.5 inch deep and StudScan for studs up to 0.75 inch deep. Lastly, the product also has the capacity to detect live AC wires to prevent drilling into highly risky electrical hazards. As one of the cheapest electronic stud sensors on the market, it’s also one of the most popular for home use. Most users say it does a fairly good job locating studs but others claim it wouldn’t detect a stud behind drywall where another model would. If you have the budget to go with our top pick, the ProSensor 710, we feel it’s a better and more consistent option. Even the magnetic CH Hanson seems more reliable to us but we simply included this model due to its popularity. A magnetic stud finder operates without any batteries since it uses a rare-earth magnet (or magnets). It doesn’t actually detect studs but instead locates the nails or screws attached to the wood. It’s a little more time consuming to operate and doesn’t work so well on the walls of older buildings where a deeper scan is needed. Conversely, an electronic stud finder includes electronic components with the ability to use actual sensors to assist you in discovering the precise location of studs. Moreover, such electronic devices come with LED lights and audible tones to inform you the moment the edge of a stud is detected. It is used to detect framing studs placed behind the final walling surface, typically drywall. Sometimes it relies on detecting the metal in the studs to locate them. A few models are also useful on floors and ceilings. It’s usually a variety of reasons. Sometimes builders rush and studs in walls aren’t totally straight or have slightly shifted over time. Sometimes the drywall contains small bubbles which may interfere with a stud finder. Most often, false positives occur with and electronic model which for some reason is giving a false reading. It’s a good idea to have a cheap magnetic stud finder (like the CH Hanson above) to double-check your reading.